Tutors provide instruction to students outside a traditional classroom setting. They work with individuals who are having difficulty understanding a particular subject, want to get ahead in school, or are preparing for standardized exams like the SAT or ACT. Tutoring jobs allow you to earn extra money if you have expertise in a particular subject and the ability and desire to share your knowledge with others. Depending on students' or employers' preference, you may need to have a college degree in the subject you wish to tutor. Some employers will only hire certified teachers or individuals who have a graduate degree. Will You Make a Good Tutor? In addition to having subject proficiency, tutors need excellent interpersonal, listening, and verbal communication skills. You need the ability to instruct others, convey information to them, and carefully listen to what they tell you so you can understand their needs. Problem solving and critical thinking skills are also essential. You must be able to identify your students' deficiencies and ways to correct them. A fundamental part of tutoring involves monitoring your students in order to track their progress. You can't be afraid to offer constructive criticism. There are several paths you can take if you want to become a tutor. They include working for a national tutoring or test prep company or online tutoring service. You can also set up your own business. Some colleges hire peer tutors to work with fellow students. As a self-employed tutor, you can set your own fees and hours. You can choose the number of clients you have. There are some downsides to going out on your own. One is that you will have to promote your services, which usually comes at a cost. Some self-employed tutors choose to register with a web-based referral service which may charge a fee or commission for this service. National tutoring services pay set fees. It is unlikely you will be able to choose your own schedule or the number of hours you will work. The good news is you won't have the task of promoting your services. Online tutoring services offer their workers a very flexible schedule. You can connect with a student at a time that works for both of you. While some set a minimum number of hours you must work, others allow tutors to decide how many clients to take on. There are several national tutoring centers with locations around the United States. Some even offer their services in other countries. Here is information on three of them. None of these employers reveal salary information, other than stating they offer competitive salaries. Sylvan Learning Centers: Sylvan hires subject and test prep tutors. Contact one of their 750 locations in the U.S. and Canada to learn about employment opportunities. Some positions require teaching credentials, while others require a four-year degree with coursework varying by subject. Huntington Learning Center: Huntington Learning Center tutors also instruct students in various subjects as well as preparing them for the SAT, ACT, and other standardized exams. Each local center hires its own tutors and qualifications depend on their subject area. The Princeton Review: The Princeton Review's primary focus is test prep—SAT, ACT, AP, and graduate school admissions exams—but it also offers online homework help on demand. Tutors provide instruction in a classroom setting at a location in the U.S. and Canada, or online. You must be at least 18 and pass a qualifying exam. Two to five weeks of training is required for each test you want to teach. You will have to commit to working at least five hours per week. Apply online. 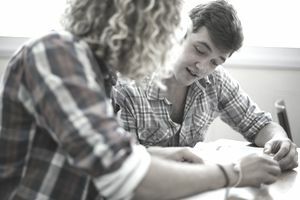 Online tutoring services, like the ones listed here, allow tutors and students to work from anywhere they have a computer and internet connection. They offer their services around the clock. Tutor.com: You must commit to 5 to 29 hours per week if you want to work for Tutor.com. Clients include middle and high school students, college students, and adult learners. Only apply if you are a college sophomore or higher. A four-year degree is required for some subjects. You must complete an application and pass an exam on the subject in which you want to tutor before the company reveals salary information. It promises to pay tutors on a regular schedule. Skooli: Skooli's requirements are a bit more stringent than those of other online tutoring companies. You must have a bachelor's degree and teaching certification, a graduate degree, or a specialized instructional certification, for example, ESL. You will receive $25 per hour, which the company will pay once your balance reaches $100. Smarthinking Online Tutoring from Pearson: Unlike the other companies listed here that accept applications on an ongoing basis, Smarthinking recruits tutors based on need in a particular subject area. Advanced coursework or a graduate degree, in addition to college-level teaching or tutoring experience is required. Tutors must commit to 8 to 19 hours per week. Do you prefer to work for yourself? One way to get clients is by registering with a referral service like the ones listed here. Wyzant: There are many benefits to registering with Wyzant—you set your fee. The company handles payments from clients, you can meet with clients in person or use the company's online tool, and creating a profile and searching for tutoring jobs is free. Wyzant promises two tutoring job opportunities per week. The one downside is that it takes a portion of your fee. However, the percentage of the company's commission decreases the more hours you work. Account for this when setting your prices. Knowledge Roundtable: Knowledge Roundtable is a free service for tutors and students. Register and create a profile. It is far less popular than Wyzant so fewer people end up there when searching for a tutor, which may translate into fewer jobs for you. Tutors handle their own payments. TutorZ: A matchmaking service for tutors and students, TutorZ publishes "tutor wanted" announcements. Purchase any tutoring jobs in which you are interested for a few dollars and you will get the students' contact information. Top 10 Fastest Growing Industries in the U.S.
Lost Your Retail Job? Check Out These Career Opportunities. Do You Know If Your Job Is Safe From Being Taken Over by a Robot?